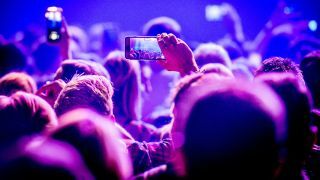 Ticket website Skiddle has carried out a survey of music fans between the ages of 16-30 to discover their opinion about using phones at live shows. A total of 1200 people responded to the study, which found that only 27% of them wanted to see phones banned at gigs. Of those 27%, 37% said they were distracting, 34% reported that phones took away from the experience, 20% were unhappy as they blocked the view of the artists, and 8% said filming and taking photographs was disrespectful to the band or artist. A total of 24% like to share the experience on social media, while 13% reported that they have the right to use the phone as they’ve purchased a ticket. Artists including A Perfect Circle, Green Day, Sebastian Bach, Corey Taylor and Disturbed have been vocal about their opposition to fans using phones during live sets. However, Fear Factory’s Dino Cazares reported last year that fans have the right to use their phones if they wish. 20% Off Eyesore Merch for TeamRock+ Members!